Technology is a democratizing force. From the printing press to modern digital media, each new wave of technological advancement brings greater access to information, skills development, and knowledge than was previously available. As modern technology advances more rapidly than ever before, access to education in tech has increased in tandem. With nothing more than internet connection, individuals across the world can access free or low-cost massive online open courses (MOOCs) through sites like Codecademy, Udacity, or Udemy, and teach themselves technical skills like programming, design, and data analytics from the comfort of their homes. Increasing access to tech education is important for three primary reasons. First, technical skills have become an increasingly important component of many jobs. Therefore, creating equal access to tech skills translates to greater equity in terms of accessing employment opportunities. Second, teaching tech skills is crucial for driving innovation. If large segments of the global population are unable to learn technical skills, the world is robbed of the software, programs, or other innovations they could have created. Third, educating greater numbers of people in tech is critical for meeting the growing demand for tech-focused professionals. At present, demand for tech talent far outstrips supply, and increasing access to tech education can help narrow the divide. Despite significant progress in democratizing tech education, universal access has not yet been achieved. Many people cannot utilize educational resources because of obstacles like language barriers and the high cost of internet. In Ghana, the monthly cost of high-speed internet equates to 15 percent of the average person’s monthly salary. 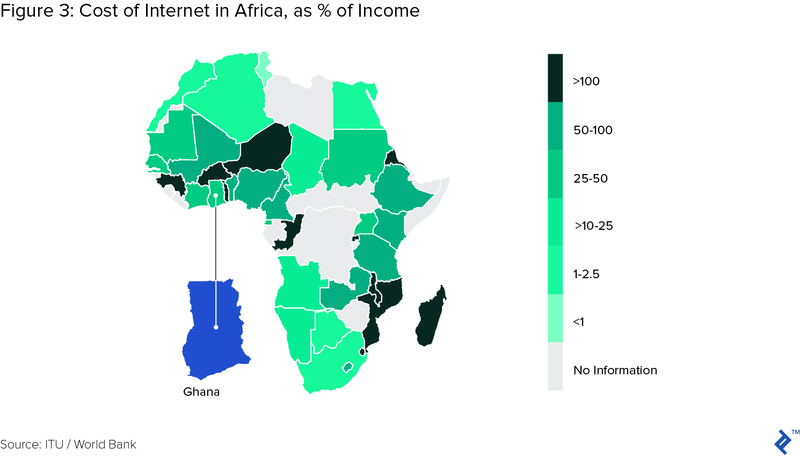 In other African countries, internet costs are sometimes even greater than the average monthly salary. This is an issue across the developing world, with research indicating that approximately 60 percent of people in developing countries do not have access to the internet. To address this, several companies have developed programs to make tech education accessible to more of people. For example, in 2016, Mozilla partnered with UN Women to launch programs to teach digital literacy to women in Cape Town, South Africa and Nairobi, Kenya. In 2017, IBM launched ‘Digital - Nation Africa’ in partnership with the UN Development Programme to teach digital skills to African youth through an online platform. Toptal is similarly working to democratize educational access through the Toptal Scholarship for Women, which awards an annual monetary and mentorship prize to female leaders from each continent. Martha Teiko Teye developed an interest in coding while pursuing her degree in electrical and electronic engineering. She opted to take a computer science course to learn code but quickly realized that completing the online-only course would be challenging. The high ISP costs in her hometown of Accra, Ghana prevented Martha from accessing the internet to follow the course. Despite this, Martha’s determination to learn to code compelled her to be creative. She printed PDF versions of her lessons and practiced C++ using pen and paper, logging on to a friend’s connection to compile her work when complete. Martha’s story touches on two key obstacles to democratizing tech education. First, it is difficult to anticipate every barrier that could prevent someone from accessing online resources. Second, it is difficult to predict who will be affected by each barrier. For example, organizations may not expect a university-level engineering student to lack internet access, but prohibitive internet prices were a key obstacle to Martha’s learning. For this reason, Toptal takes a bottom-up approach by empowering people to elevate their own communities rather than dictating development from the outside. Through the Scholarship for Women Program, Toptal seeks to identify and invest in female leaders that are driven to affect wide-scale change. Toptal aims to create a ripple effect whereby scholarship recipients leverage Toptal’s prize of $10,000 and expert mentorship to create successful, long-term initiatives that bolster their communities in meaningful ways. Toptal is proud to name Martha Teiko Teye as the first recipient of this year’s scholarship prize, selected from hundreds of candidates throughout the continent of Africa. Martha represents the type of person that Toptal seeks to empower—one that is capable and committed to advancing both herself and those around her. After teaching herself several coding languages, Martha now has her B.Sc. in electrical engineering and a nanodegree in front-end development from Udacity. She works full-time as a developer, volunteers as a tutor to aspiring coders, and spends her free time on a passion project: an AI-driven chatbot designed to teach code interactively. The chatbot teaches users the basics of several coding languages, enabling them to pursue further fluency in areas of their choosing. To ensure that inaccessible internet does not preclude anyone from using the chatbot, she created an offline version that runs on Raspberry Pi, a portable, low-cost computer that is both affordable and accessible for users. The $10,000 scholarship award will be used to fund Martha’s ongoing studies in data science and machine learning and to obtain server space for her bot. She also plans to use the funding to purchase Raspberry Pis and LED screens for her learners. In addition to the financial award, Martha will receive a year of one-on-one mentorship from a Toptal expert. She plans to use the partnership to examine and refine the long-term plan for her bot, explore new techniques for increasing its capacities, and learn new skills as a developer. 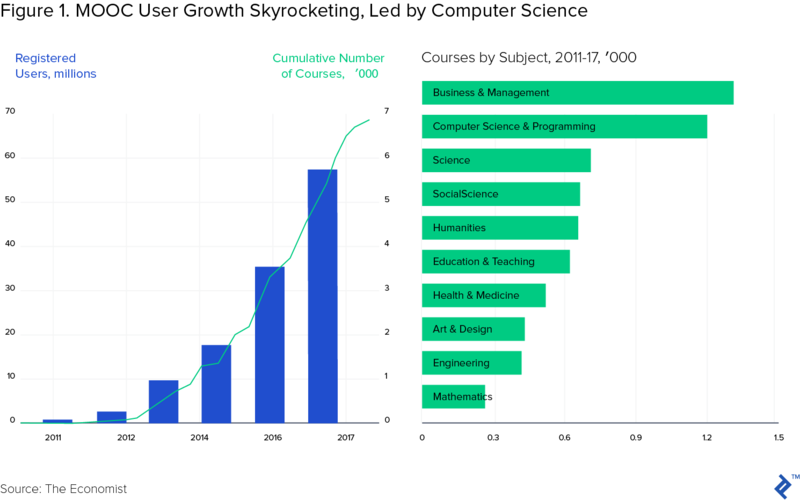 The creation of online courses represents a first step toward democratization of education, but further efforts must be made to facilitate access to those resources. Martha’s story illustrates both the existing barriers to online education and the incredible benefits that are yielded when those barriers are removed. Through Martha’s own work, young women in her community will be empowered to direct their learning and employment prospects in the same way that Martha has. Moving forward, private, public, and voluntary organizations must continue to empower marginalized groups and do so in a way that utilizes local peoples’ insights on how their communities can best be helped. Toptal recognized that by combining Martha’s intimate understanding of her community’s needs with the organization’s resources and guidance, the most effective strategy for empowering the community could be achieved. Toptal is confident that Martha’s chatbot will do exactly that and looks forward to continuing its mission to make tech a more open, accessible, and inclusive space.